The horror anthology has deep roots in the genre, from the early collected works of Edgar Allan Poe and H.P. Lovecraft, to the EC Comics of the ‘50s, horror fans have always loved being scared in a myriad of ways. Although pre-dated by 1972’s Tales From The Crypt, an early adaptation of EC’s horror stories, 1982’s Creepshow took the spirit of those original comics and made them all its own. Directed by genre legend George A. Romero and with a screenplay by horror bard Stephen King, Creepshow is a match made in heaven for lovers of horror and one of the most influential and best of its kind. Fourteen years after he shocked the world with Night of the Living Dead, Romero had, in the interim, made quite the name for himself as a purveyor of both timely and gruesome horror. Also within that span, a new legend in horror was making a name for himself in the literary world. Stephen King, whose debut novel Carrie was released in 1974, would go on to write a string of best-sellers throughout the decade, including classics such as Salem’s Lot, The Shining, and The Stand. A monolith in the genre, by the end of the ‘70s King had his choice of projects to work on, which eventually led to his meeting with Romero. Both being huge fans of the horror comics of their youth, they got the idea to put together a horror anthology that harkened back to those classic stories. The product of their collaboration was Creepshow. Devised as a true “comic book” movie, Romero and King, along with the talents of cinematographer Michael Gornick and make-up effects legend Tom Savini, crafted an experience like few others. Using bright primary colors, comic book panels for transitions, and a sense of humor that borders on the profane, Creepshow is a pure delight. 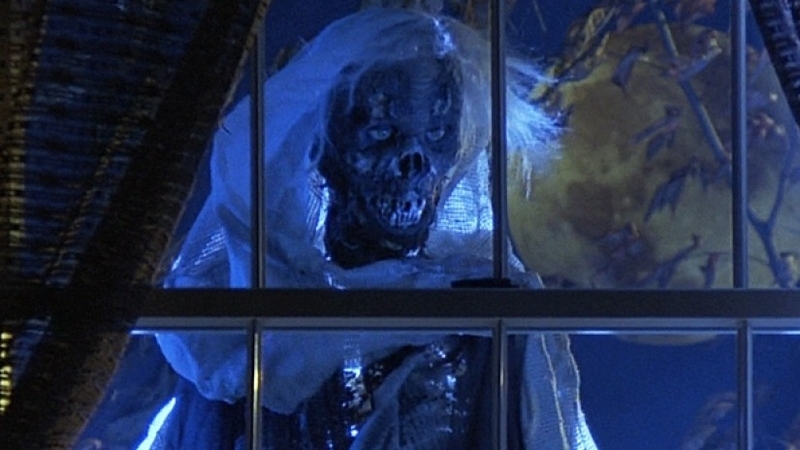 Every segment in Creepshow is effective in its own way, which is a rarity for an anthology film. It all starts with a fun wrap-around story starring a rare mustache-less Tom Atkins as an overbearing father who hates horror comics. He catches his son, played by King’s son Joe Hill, reading horror comics and is incensed that such a thing could happen. After a fight in which he takes the book away, the father throws the comic in the trash and we get on with the show. The first segment, “Father’s Day,” features some typically great makeup work by Savini on the titular father, and of course being a Romero picture, you get a zombie. The design is gross but in going with the overall tone, also comical at times, especially when dad finally gets his long overdue cake. Next up is the silliest story of the bunch, but also one of the most disturbing. 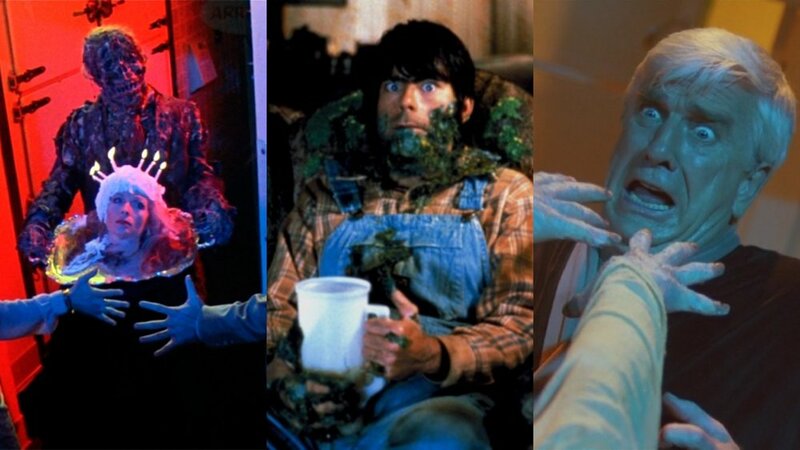 Stephen King plays a local simpleton in “The Lonesome Death of Jordy Verrill.” Starting much like The Blob with a meteor crash-landing in a field, dumb Jordy sees a possible goldmine since the local university apparently has a Department of Meteors that will pay a high price for his find. Obviously things go terribly wrong for Jordy and we get some great makeup in the process as he slowly becomes a horrific plant person. It’s a quick segment, which is probably for the best, as it’s certainly the weakest of the bunch. After Verrill meets his fate we’re whisked away to the Jersey Shore for a tale of revenge from beyond the grave entitled “Something To Tide You Over.” Starring Ted Danson and Gaylen Ross as lovers murdered by a jealous husband in the form of Leslie Nielson (before he went full comedy with Police Squad), it was filmed on location in Island Beach State Park in New Jersey. More great makeup, this time in the form of water-logged zombies terrorizing Nielson, and a fitting end lead us to the best segment of the picture. “The Crate,” running at about 40 minutes is both the longest and best story in Creepshow. With a cast that includes the always great Hal Holbrook and Adrienne Barbeau, it’s also the most violent. The story of a constantly berated professor, his mean-spirited wife and a crate filled with an elderly, blood-thirsty beast, the gore effects here are off the charts, as are the comic book flourishes. Legitimately scary at times, “The Crate” is the one segment here that could have easily have been feature length, but what we get is an all-timer of horror. For the next segment, “They’re Creeping Up on You,” we get an eccentric and evil millionaire who is besieged in his sterile high-rise apartment by an army of cockroaches. This story puts my worst nightmare on the screen. I hate bugs! They’re gross and have no business being in my living space. Well, Upson Pratt (character actor E.G. Marshall) gets to live and die in this particular nightmare. The grossest effects in Creepshow come at the climax when he’s devoured from the inside-out by the creepy-crawlies. This Halloween season, Scream Factory has gone all out with their deluxe edition of the film, and it’s a must-own for fans. The film has never looked better, featuring a new 4K scan of the original negative that’s been enhanced and color-timed by Gornick. With most of the colors and effects done in camera, he was limited by the technology of the time, but now in the digital era, he’s been able to bring Creepshow as close to what was originally conceived. It’s never looked more “comic booky” and that’s a good thing. It’s exactly what the filmmakers were going for and it finally shines through thanks to this release. A bounty of new bonus features are included and feature interviews with Gornick, the cast and crew, and in a strange addition, the founders of Mondo, purveyors of hard to acquire movie posters. Worth it for the transfer alone, Scream Factory’s Creepshow belongs on any horror fan’s shelf. It’s a true deluxe edition and their best release yet. A love letter to anyone who grew up being terrified and laughing with (not at) Romero and King’s creation, this is one of the most comprehensive Blu-rays of the year and bound to become a Spooky Season tradition for the uninitiated.